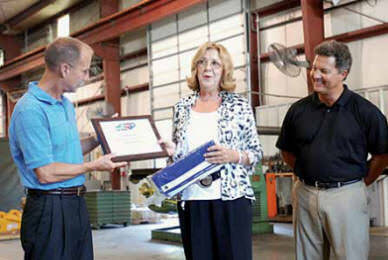 A proud day at Tandemloc as Production and Safety Manager Curt Pope was awarded the Safety and Health Achievement Recognition Program Certificate by the North Carolina Commissioner of Labor, Cherie Berry. This auspicious visit by Commissioner Berry highlighted Tandemloc's efforts to develop and maintain a safe working environment spearheaded by the ever diligent Mr. Pope. We're very proud of Curt's achievements and recognition and his great efforts to make Tandemloc a safer and better place to work. Our products and production are just too heavy-duty and would be dangerous if we did not take safety into account at every step. Thanks to our safety-conscious people, that's just what we do.